If you’re a coffee aficionado, take a few minutes today to evaluate your home coffee situation. Do you have an unnecessary number of mugs? Is counter space for food preparation being unreasonably sacrificed for your coffee supplies? Can you rearrange your current setup to be less cluttered and better contained? A few minutes is all this simple check should take. When I looked in on my coffee supplies last week, I found that I had more than 20 mugs in my cupboard. I donated 12 of those to a local homeless shelter and now have enough space in my cupboard to store all of my coffee supplies. I hope your efforts produce similar positive results. I would be wary of suggestions of freezing coffee. I believe that one-time freezing is acceptable but, doubt that most consumers follow that. It’s more likely the average person would take it in and out every time they brew coffee. There would be slight thaw and refreeze made in the trip. Doing so would produce freezerburn akin to month old ice cream. I think the jury’s still out on freezing, as well. I’m one of those people who buys green beans and roasts their own, for the full report, check out sweet marias (dot com). they have GREAT insights into a life of coffeeism. I am not an employee or working for them in any capacity, I’m just a customer. They have all the tools for storage, and extensive research into all things coffee. Were it not for them, I probably wouldn’t be awake right now. Definitely do not scoop from a bag in the freezer on a daily basis! As I was writing the post, I was thinking of a scenario where you might pick up a ten pound bag of coffee beans while on vacation in Brazil and have more than you could drink in a month’s time. I agree with “The Paul” there. Don’t freeze unless you can be sure to get most of the air out, and they are sealed VERY WELL. The porosity of coffee beans will take on the smells of anything else in the freezer. Another thing to consider if you freeze your beans is to ensure that you only freeze them once. If you can seperate them into multiple weekly packs. Hmm. Is this similar to tea storage? Once again, a timely post. I just YESTERDAY moved our coffee mugs from living next to our regular glassware to living on a shelf directly above the coffee maker. Duh, right? I also got rid of all the coffee mugs that don’t match our eight red, heavy ceramic mugs. I went through and got rid of all the thermal, to-go coffee mugs we never use, either. My husband and I each have our favorite and there’s no reason to have more than that. Coffee storage is next. I have a plethera of tupperware and will undoubtedly go back to whole bean once we get rid of the ground coffee we received as a gift for the holidays. ALOT of it. And yes, it’s ground and yes it lives in the freezer. Long time reader… first time posting! I don’t drink coffee or tea, but I have to have these things in my house for guests. How should you manage coffee then? My guess is I’ve been serving stale coffee for years but would never know it! Ikea had these cool clear stackable coffee cups. They’re really inexpensive and save valuable cupboard space. Ergonomically perfect their only downside is they hold only 6-8 oz. Perfect for me but not so for serious coffee drinkers. Mugs take up so much space otherwise, don’t they? Wouldn’t storing it in the fridge in an airtight container be better than at room temperature? If humidity is a problem then an airtight container fixes that, and at lower temperatures, assuming you’re not freezing it where ice crystals or whatever might affect the coffee physically, any chemical aging reactions will be slower, no? @Richard — Refrigerators are high humidity appliances. Most refrigerators’ internal humidifiers run automatically at a level very damaging to coffee. @Erin Doland — That’s why you use an airtight container–to protect against the humidity of the fridge. I use an airtight VacuVin container for my whole beans, and store it in the fridge. Since the container is *really* airtight, the beans are never exposed to the humidity of the fridge. It takes at least two months before there’s much degradation in this type of storage environment (only a problem for my decaf beans, since I rarely drink decaf). Given the type of container I’m using, I can’t see any reason why the fridge would be harmful. I suppose the semi-vacuum created in sealing the container could serve to draw some of the CO2 out of the beans, but I think that may actually help flavor with some varieties by reducing coffee acidity. @Travis — I’d e-mail the king of all things food, Harold McGee. His contact information is on his website at http://curiouscook.com/cook/home.php. He could explain his reasoning better than I could for his science behind being anti-refrigerator. I’d love to know what he says!! I don’t understand this post. How can there possibly be too much space devoted to coffee? A better suggestion is to get rid of kitchen items devoted to non-coffee uses, in order to make room for more coffee-related items. I was thinking the same thing! I don’t drink tea or coffee, but I do have coffee bags and tea bags around, for guests to make their own… I hope if it’s stale, someone would let me know. I did warn the last guest, though, that I had no idea how good the coffee was because I’d had it for a while. Good post. One important thing I didn’t see mentioned is to make sure one allows the frozen beans to return to room temperature and allow any moisture to evaporate. Shannon – Assuming you have some advanced notice of when your guests will be arriving, I recommend buying 1/4 to 1/2 of a pound prior to entertaining. the problem with keeping coffee in the fridge is not the humidity inside the fridge, but that the coffee and the container is cold when you take it out and open it up. warm or room temperature air gets into the container when opening it up and a very small amount of the humidity in the room temperature air condensates on the inside of the container and on the coffee itself. @Lauren — I meant that Travis should address his specific question to McGee. There may be exceptions for technologically advanced containers that have been released since McGee’s book was published. Travis seems to think that he has a special container that is different than any container McGee may have considered during the course of his research. And, since I was only quoting McGee in my article, Travis might benefit more by going to the primary source. I’d be surprised if most people could tell the difference between coffee that’s been frozen, refrigerated or stored in whatever method is popular this month. I think like a lot of things in life, people spend too much time trying to figure it out. I’m sure some folks will claim to have the delicate taste buds to discern this, but for most of us, buying good coffee and freezing it will be just fine. Frozen coffee beans will sweat while defrosting and the moisture will destroy the flavor. Buy beans fresh and in small quantities from dedicated direct trade roasters! That is my one indulgence every day. I’m have a coffee adiction but i never thought about the best way to store it. I keep the roasted beans, at room temperature, in a air tight canister and I ground a few when i need. I was glad to know from this post the best ways to keep my coffe in good conditions. 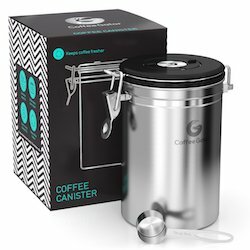 Tim–just under $50 for a burr grinder?!?! That seems…totally reasonable for such an upgrade from the spinning blade grinder. Great topic–I ditched many mugs in the The Great Purge of 2006 and have never, never missed them. Bed, Bath and Beyond actually has several for $50 to $60. The only thing I don’t like about mine is that it is very loud. I grind my coffee in the garage so I don’t wake up the rest of the house. I use my same coffee mug every day. I just rinse it out and put it back in the cabinet. OMG, i’ve been doing it all wrong! i grind my coffee at the store (and here i thought a coffee grinder was a unitasker), then i keep the package in the freezer, NOT in a special canister, and open it every day for like three weeks until it’s gone! please don’t send me to coffee drinker jail with all the instant freeze dried coffee crystal folks. I have learned that you are not to freeze dark roast coffee at all. The other type of roasts you can. Not exactly sure of the reasoning, but I take the advice. we are an aeropress family and a room temperature coffee storage family :). I love your blog, I’m adding it to my bloglines,..I could use some more decluttering in my life!! to those who only have coffee and tea for guests – unless you have a lot of suprise guests, just go to the local coffee shop and buy a quarter of a pound and have them grind it whenever you are having guests – coffee shops are happy to sell small quantities unlike grocery stores. Also, do not buy the grind it yourself from a grocery store, you are just getting the previous purchasers selection. Throw any leftovers away if these are any. That way you do not have to worry about grinders or storage and you guests will love you for the effort. The least expensive, worry free solution. K…Here’s the gospel to Alton Brown. Never grind you beans ahead of time. Never store in a fridge/freezer. Anything colder than room temp will cause beans to condensate when taken out and that’s not good. Store in airtight container that is “just” large enough to hold the beans, to keep as much oxygen away from the beans as possible. Keep this container at room temperature and out of direct sunlight. Am I seriously the only commenter out of almost 30 that’s scene the coffee ep. of Good Eats? @Henry — I’ve seen the episode of Good Eats, but I take Harold McGee’s word over Alton’s. In fact, I think Alton might take Harold McGee’s word over his own … have you read the acknowledgments section of I’m Just Here for the Food? Great little write up! I’ve been ‘doing’ what I preach (to live a clutter free life). My boyfriend is seeing the benefits too. I buy 2 pounds of whole coffee beans and then put 1/2 pound into an air-tight container to store and use during the week. The rest goes into the freezer. I repeat this process every week to minimize my runs to the coffee shop. It’s simple and effective in many ways. The alternatives waste too much time and money, increase carbon footprint and complicates ones life. I have been buying fresh roasted coffee whole bean from Peet’s Coffee for 35 years, have always stored the coffee, ground it, and brewed it the same way most of those years based on Mr. Peet’s advice (he passed away this past summer) and have never had anything but great tasting coffee! (I believe the founder of Starbucks began his coffee career working for Mr. Peet.) These are the recommendations directly from Peet’s website (Peets.com). Buy coffee frequently – weekly, if possible. This ensures you have the most recent roast. Grind coffee yourself just before brewing. The coffee bean acts as its own container, holding in flavor and aromatic compounds. Once the beans are ground, aromatics are released. If brewing does not happen right away, the aromatic complexities will begin to dissipate. Does anyone know of a daily ezine about decluttering? I was receiving a motivating email everyday from a good source, but for some reason it has stopped coming. I need to be motivated everyday. I have been doing really well this year and don’t want to fall back into old habits. Anybody out there want to send some motivation my way???? I’ve been making espresso (Rancilio Silvia / Rocky) for just over a year now and I’ve worked out a pretty good system with the freezer. Sadly our local roaster doesn’t know how to properly roast for espresso, so I’m still doing mail order to Intelligentsia. I get a 5lb bag of their Black Cat every month and a half, dividing the bag up into 1/2lb portions. I vacuum seal each portion and stick them in the freezer (-2F). When I need more beans, I just pull a bag out of the freezer and let it come up to room temp while still in the bag. Keeping the beans in the vacuum sealed bag prevents the dreaded condensation. That’s the really important part. And once the beans are at room temp, I leave them at room temp. No fridge, no freezer. It’s worked really well for me. P.S. Sealing items in a plastic bag when bringing them from a cold environment into a warm humid one to prevent condensation is a great trick. I also use it all the time with my camera gear. I buy coffee once a week, approximately 1/2 pound. I grind it at the store to the coarsest grind. I bring it home and dump it all into a homemade muslin coffeebag. I add approximately 10 cups of cool water and leave it all to steep on the counter for at least 12 hours. I pour that into a glass pitcher and store it in the fridge. To make coffee, I put the coffee concentrate in the mug, add dairy and just boiled water. We have less coffee waste this way and coffee stores better in my fridge coldbrewed than I could store it as beans. Typically, the coffee I brew has been roasted within the last three days. Also, iced coffee is a breeze. Ice in a glass, a little sweetener, coffee concentrate and dairy. Double Yum!!!! Amen to opening up more space for coffee! I’ve actually been doing some mental puzzle-piece-arranging to try and figure out how to get an espresso machine to fit on my counter, along with my burr grinder, drip coffee maker, tea pot, and such. Apparently, some of us have excellent priorities. My husband and I have 2 coffee mugs – one for him and one for me! I only became a regular coffee drinker a few months ago and I’ve NEVER liked it because of the bitter flavor. Found a brand of coffee that contains Chicory and LOVE it. I no longer have to put so much coffee creamer or sugar to tolerate coffee anymore. I only drink it because I need it to start my day. I even bought my first coffee pot, before I use to make my coffee in a Coffee percolator that you put on the stove or I drank instant coffee. My coffee mug holds 2 to 3 cups of coffee so I don’t drink that much coffee in the morning, only enough to wake me up and get me through the day. I’m a late bloomer to this coffee thing but I like my coffee simple, not bitter or leave an after taste.